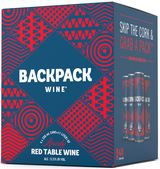 Backpack Wine taps into the same love of exploration and discovery that our independently spirited, on-the-go customers embrace. Canned wine is easy to drink, serve and socialize over. It's portable, sharable and fun to pair with any foods from casual to elegant. And that packaging…it's recyclable, it's cost-effective and it makes wine more approachable, rebellious and fresh.